Fantastica is a wonderful blend of science fiction movie sounds effects and soundtrack styled orchestration. Of course, you can't please everyone. 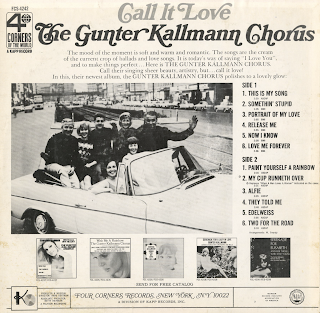 A critic at the time of release, Ralph Gleason didn't care for this project saying that it was "More like the soundtrack of a horror movie than anything else". Garcia creates an outer-space journey for the listener by blending one track magically into the next so that you can sit back, close your eyes and float effortlessly through the set! 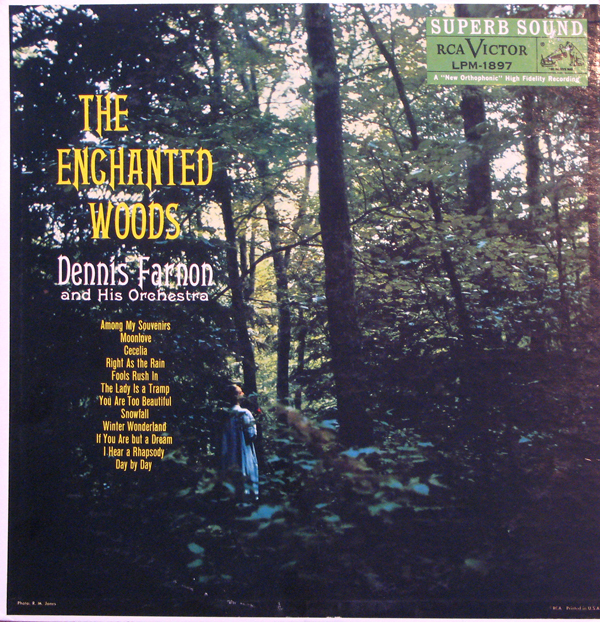 From Billboard - March 31, 1958: A fine mood set by the orkster. 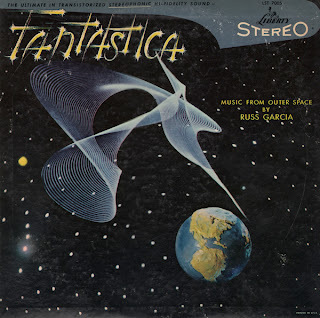 The selections all have outer space titles and are nicely orchestrated with well-controlled instrumental gimmicks. Tempos are nicely varied. A good set for jocks and one that can enjoy good sales. Sound effects on this stereo release travel from channel to channel to help make for an even spacier trip through space! Awesome! 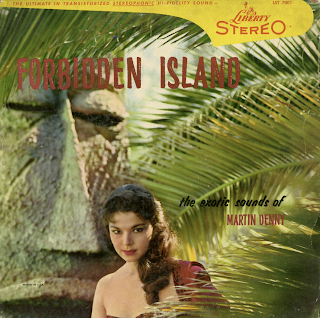 According to information I found on discogs The Waikikis were a "Belgian studio band from the 1960s, which specialised in easy listening Hawaiian style music." They were most popular in Belgium and Germany, but their releases were also available in American. The songs that emerged from behind the somewhat pedestrian cover art (a photo courtesy of America Airlines), are for the most part, are great fun and make for excellent Tiki Party music. 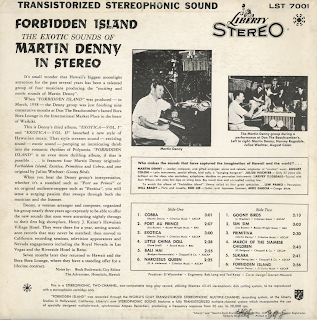 There were two different cover designs for this Denny release, one for mono (top image) and, apparently, two for the stereo release. 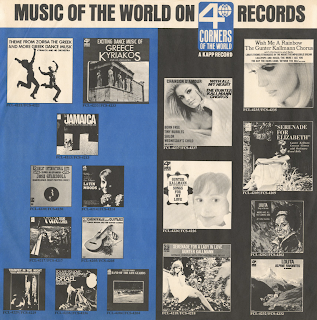 The stereo cover (bottom image) is printed on foil which is an expensive process requiring a extra run through the press first to print a white ink base to support the subsequent four color run. 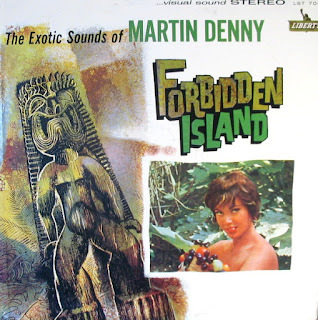 This Denny set is one of my favorite "exotica" releases. 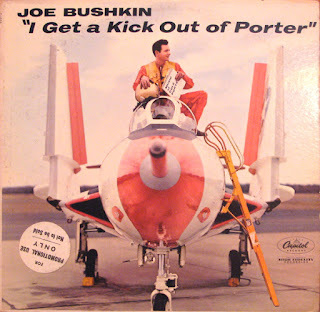 Joe Bushkin "I Get A Kick Out Of Porter"
That's Joe sitting on a F9F-8T, Gurman Navy Cougar. My copy sports a yellow label marked "Sample Album for Radio - TV Use". 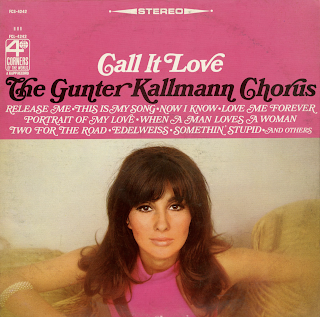 The album is a masterwork. 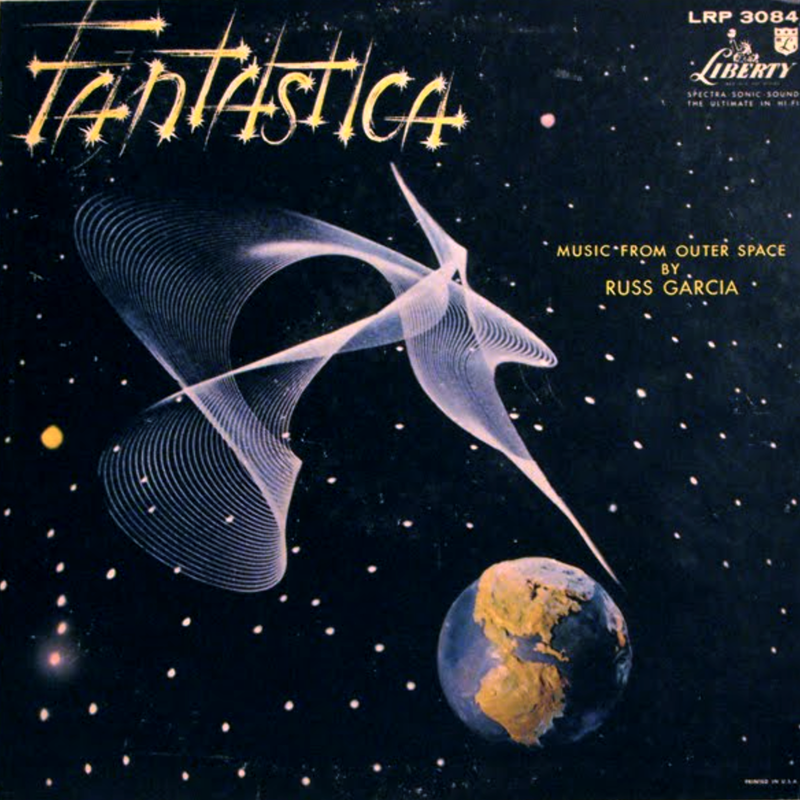 A nice blend of jazz piano and orchestration that propels you into the space age. 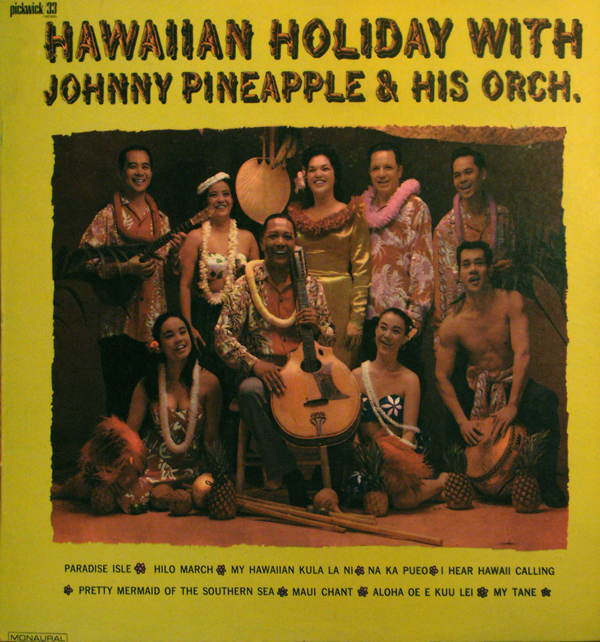 Johnny Pineapples & His Orch. 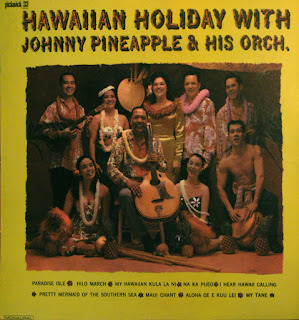 I can not find any information on the original Johnny Pineapple. Here we have another mystery LP with no information to be found even though the record label is Peter Pan (a reasonably well known company that made audio products for children). 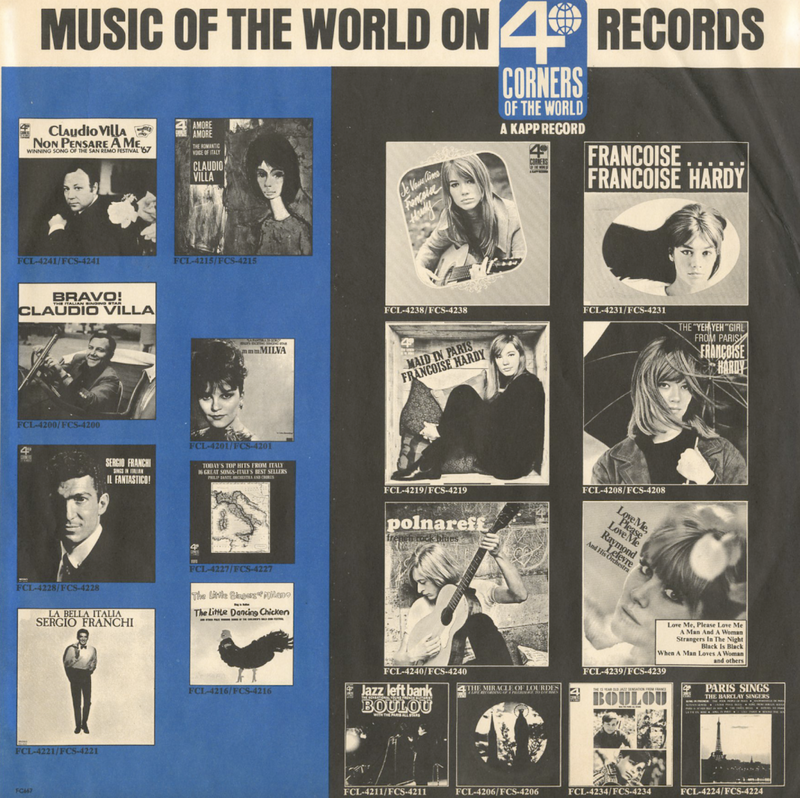 The music is a curious blend of natural sounding orchestrated instruments, synth instruments and fun noises arranged a somewhat classical style to mimic the actual soundtrack. At some point each track shoots off into SPACE to visit Planet DISCO! 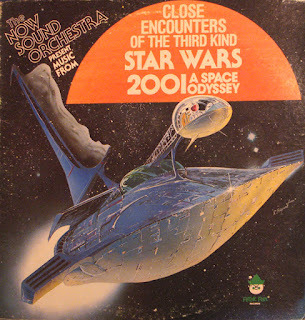 Also, in case you were wondering, like I was, what the giant thing stuck on top of the space ship is? I guess no one at Peter Pan understood what the thing was either, so they added a note to the back cover to let us know that it is a "solar sail". I can find no information on Fred Denise. 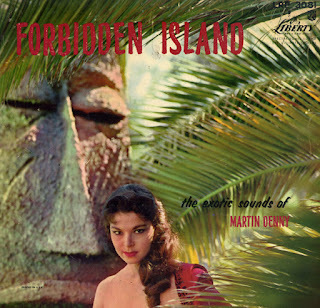 I've been researching a project by Chet Atkins recorded in 1958 -- "Chet Atkins in Hollywood." Dennis was the orchestra leader and arranger for that album. 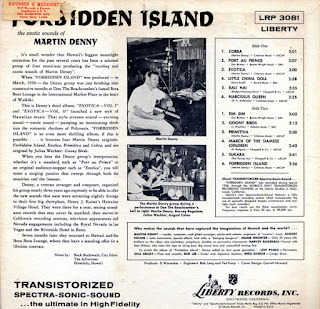 In doing my research (for a writing project), I located Dennis -- still composing and arranging, and living in the Netherlands, at age 87!! It has been amazing to talk to him about that era of music and recording. Besides being an orchestra leader and RCA artist at the time, he was also the west coast pop album A&R director for the label. The bulk of Dennis's composition work is not mainstream pop -- his most notable work was soundtracks for cartoons. He did all the soundtracks for the Mr Magoo film and tv series, and a lot of the incidental sound fx (orchestral sounds) for Rocky & Bullwinkle. He also scored for movies. He's an amazing guy. 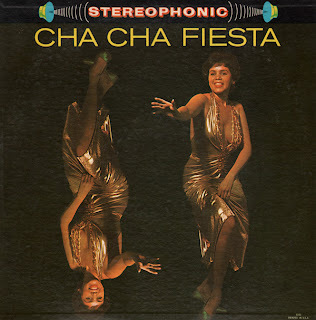 Here's a space age pop organ album with Eddie Osborn at the keyboard and Bob Rosengarden on the bongos. I love the cover with the hypo. I wonder what the doctor was injecting Eddie with? I found precious little into online about Osborn and less about this album. 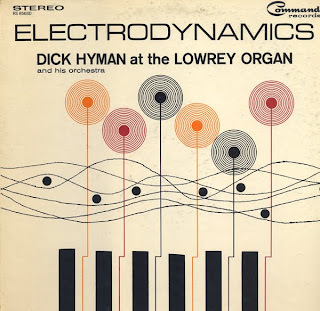 Hyman's sound, on this project, could be a little more far out (in "electrodynamic" space) for my tastes. 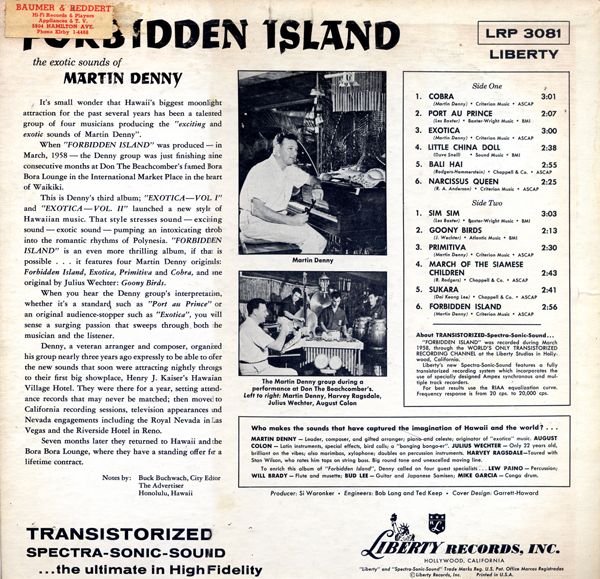 RCA - 1957 (liner notes) - 1960 Billboard's "Reviews of The Week's LP'S"
Even though Gould is well known, I couldn't find much info on this particular Gould "exotica" project. I love the jacket art. The music consists of lush instrumentals that attempt to seduce you into the "garden". Very nice... but the chick in the sparkly getup is the better seducer! 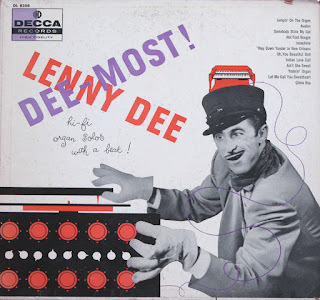 Lenny Dee - Dee Most! Lenny Dee made a PILE of recordings. This offering is listed fourth on the stack of many projects on his discography found on wikipedia. 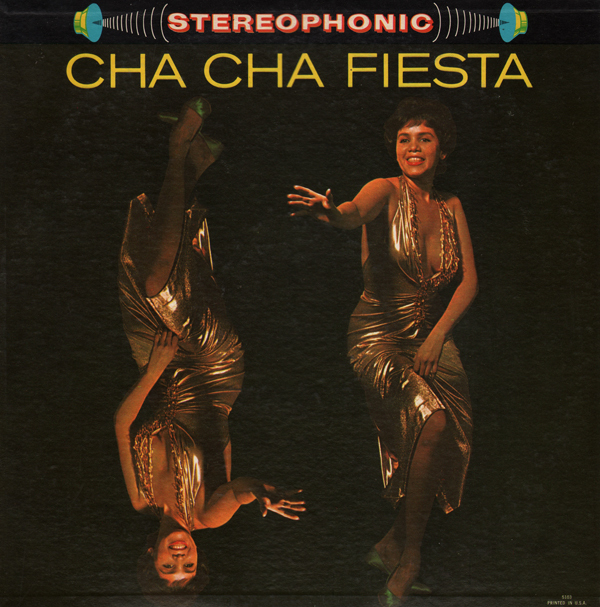 Terrific atomic age artwork on this RCA project that was produced to demonstrate the audio dynamics of new fangled stereo players.